Every single Board that we have worked with, without exception, has a very fuzzy and ill-defined ROLE for their Board vis-à-vis INCOME. One of the very best Executive Directors we’ve ever worked with actually told us that her Board’s ‘funding strategy’ was to buy LOTTERY TICKETS! It would be funny, if it wasn’t sad. CHAMPION… the CAUSE and the CASE. INVITE… others to get INVOLVED and ENGAGED. INVEST… with a COMMENSURATE COMMITMENT (to help FUND THE VISION). Specific Board Members are also a critical part of your SALES TEAM! They can help get the visit, predispose the visit, possibly join you on the visit, and definitely help follow-up after the visit. Some thoughts to help you and your Board better understand these 3 big words. INVITE. Your Board Members and Champions need the opportunity to INVITE others to become INVOLVED and ENGAGED in your Impact. Just imagine if you went to your Board and said, “We do not want you asking people for money! We need you to INVITE a qualified prospect to a tour or memorable experience.” This is 100 times better than asking them for names! INVEST. The ‘COMMENSURATE’ word changes everything! Every single Board Member should make an investment (of time, energy, money) that is COMMENSURATE with their relationship, capacity, and involvement with your organization. Special Note: ‘INVEST’ has nothing to do with Board Members ‘giving or getting $10,000’. Nothing to do with ‘time, treasure and talents’ from the 1950’s. 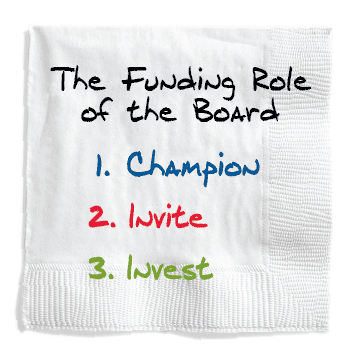 A $250 gift from one Board Member could be both commensurate and sacrificial. A $1 Million gift from another Board Member could be neither commensurate or anywhere near a sacrifice. This COMMENSURATE strategy allows you to take a Board Member who is a $10,000 (commensurate) investor on a visit to present the opportunity to a $1 Million investor. We realize (from a lot of comments and feedback from our For Impact audience) that many Board Members have been told very specifically that they did not have to give money to be on the Board. We still strongly believe that you should have this discussion with your Board around their ROLE, including the ‘INVEST with a COMMENSURATE COMMITMENT’ point. Why? Because it’s all about the IMPACT. If they believe (CHAMPION), they should both INVITE and INVEST. BURDEN. SACRIFICE. Is it no wonder that your Board Members are not enthusiastically and passionately engaged in your fundraising and your campaigns? Read more about The Role of the Board in our Guidebook: On Boards.